Meet Violet, the eccentric child birthed by Madison poet Jeanie Tomasko and delivered into the world by new Wisconsin publisher Taraxia Press. Tomasko’s Violet Hours is collection of poetry crafted as a sweet gift, a small, hand-stitched book with a French wrap cover and violet flyleaf. The cover art is of a sedate teacup and sugar bowl with a partial skull, waiting like a treat, next to it, a warning, perhaps, of what is to come. Violet investigates the things many of us (and most little girls) try to avoid: chicken hearts, the interior of a Bleeding Heart flower, and cicadas. In one poem, she hosts a strange birthday party where guests cut insect shapes out of cellophane. In another, Violet decorates paper dolls with beetle wings, makes a bra from old bullet casings, a briefcase made from one of her scabs. In yet another, she strings together the bodies of dried Daddy Longlegs, as if to make a necklace. Violet’s peculiarities unfold in a series of traditional, free-verse, and, most often, prose poems. These poems may give readers the creepy crawlies, but that’s the poet’s intent. Perhaps, what makes us uncomfortable is the thing to which we must attend. 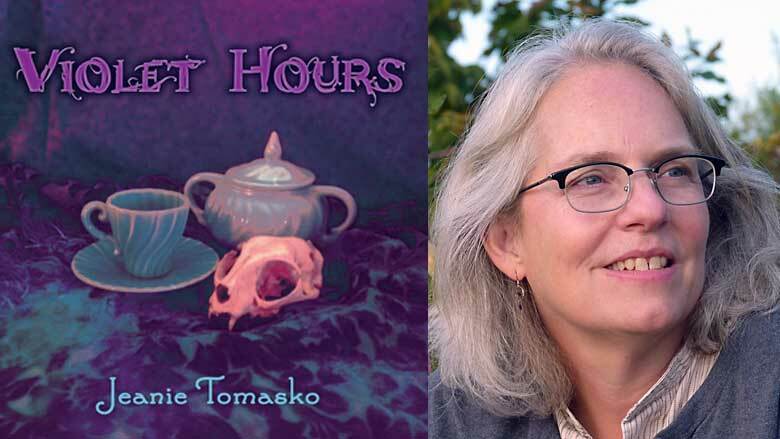 In spite of the character’s “purplish” name, Tomasko focuses much of her imagery on the color red, from blood-rusty saws to blood collected at a birthday party to a raspberry-themed party where spiders crawl over the berries. Violet Hours concentrates, too, on the trope of hearts, whether they are the ones Violet’s father taught her to cut and deliver to neighbors on Valentine’s Day or the ones she saves when her father makes chicken for supper. Violet’s curious heart beats through these poems, as well. When Violet creates her Valentine hearts, she cuts a small tail on the top, calls it the “superior vena cava.” In “Bleeding Hearts,” she wonders why her father had never “told her the real shape of the heart.” Does a heart—whether static on paper or live and pulsing—change shape with the act of growing up from child to adult? and the delicate inner petals, a pair of skates. hearts for each classmate and the teacher. Violet had injected prior to class. However Violet might be defined—a strange child living in a world of imagination or a bug-obsessed girl and future entomologist or a psychotic possible serial killer—she will likely steal your heart.